Sahabat SBI pernah membaca biografi tentang seseorang? Apa yang sahabat SBI ketahui tentang biografi? Dalam bahasa inggris, biografi masuk kedalam jenis recount text. Masih ingat bukan apa yang dimaksud dengan recount text? Recount text is a text that tells about something that happened in the past. Dengan kata lain, recount text merupakan sebuah text yang menceritakan sebuah cerita atau aksi di masa lalu dengan tujua untuk memberikan informasi kepada pembaca. Generic structure dari recount text pun ada 3, yaitu orientation, events dan juga reorientation. Habibie was the fourth of eight children, couples Alwi Abdul Jalil Habibie and R.a. Tuti Marini Puspowardojo. His father’s profession as an expert of agriculture comes from Gorontalo ethnic Bugis descent and have, while his mother’s surname. R.a. Tuti Marini Puspowardojo is the son of an eye specialist in Yogya, and his father was named Puspowardjojo served as the owner of the school. B.j. Habibie is married to Hasri Ainun Besari on 12 May 1962, with whom he had two sons, namely Ilham Akbar Habibie and Thareq Habibie Kemal. Habibie has previously worked at Messerschmitt–Bölkow–Blohm, an airline company based in Hamburg, Germany, thus reaching the peak of his career as a Vice President of technology. In 1973, he returned to Indonesia at the request of former President Soeharto. Habibie met Helmut Kohl in Germany. He then served as Minister of research and technology since 1978 to March 1998. Before serving as the President (May 21, 1998-October 20, 1999), was Vice President BJ Habibie (14 March 1998 – 21 May 1998) in the seventh development cabinet under President Suharto. He was appointed Chairman of KADIN (Indonesia Muslim Intellectuals), during his tenure as Minister. Presidency Inauguration of President B.J. Habibie on May 21, 1998 Official photos and Ainun Habibie in 1998. Habibie inherited the chaotic state of conditions in post Suharto’s resignation breaking loose on the new order era, giving rise to rampant riots and disintegerasi almost the entire territory of Indonesia. Soon after acquiring the powers of President Habibie soon formed a Cabinet. One of the tasks is the importance of the back support from the International Monetary Fund and the community of donor countries for the economic recovery program. He also frees political prisoners and reducing controls on freedom of speech and the activities of the organization. During his brief he managed to give a solid foundation for Indonesia, at which time the Antitrust ACT of being born or healthy competition ACT, political parties ACT changes and the most important is the ACT of the autonomous region. Through the application of autonomous region ACT this is the turmoil of disintegrating inherited since the new order era successfully muted and finally completed in the era of President Susilo Bambang Yudhoyono, in the absence of regional autonomy ACT certainly Indonesia will suffer the same fate as the Soviet Union and Yugoslavia. The appointment of B.J. Habibie as President raises a wide range of controversies for the people of Indonesia. The party pros consider the appointment of Habibie is already unconstitutional. It complies with the provisions of article 8 of the Constitution states that “when the President died, stopped, or is unable to perform its obligations in his term, he was replaced by Vice President until the time runs out“. While the counter parties consider that the appointment of B.J. Habibie is considered unconstitutional. This is contrary to the provisions of article 9 of the Constitution states that “before assuming the post of President then the President would have to say the oath or pledge in front of the ASSEMBLY or of the PARLIAMENT“. Prof. Dr.-Ing. H. Bacharuddin Jusuf Habibie, FREng (lahir di Parepare, Sulawesi Selatan, 25 Juni 1936; umur 79 tahun) adalah Presiden Republik Indonesia yang ketiga. Ia menggantikan Soeharto yang mengundurkan diri dari jabatan presiden pada tanggal 21 Mei 1998. Jabatannya digantikan oleh Abdurrahman Wahid (Gus Dur) yang terpilih sebagai presiden pada 20 Oktober 1999 oleh MPR hasil Pemilu 1999. 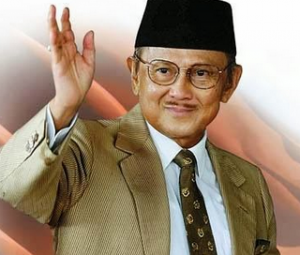 Dengan menjabat selama 2 bulan dan 7 hari sebagai wakil presiden, dan 1 tahun dan 5 bulan sebagai presiden, Habibie merupakan Wakil Presiden dan juga Presiden Indonesia dengan masa jabatan terpendek. Saat ini namanya diabadikan sebagai nama salah satu universitas di Gorontalo, menggantikan nama Universitas Negeri Gorontalo. Habibie saat bertemu Helmut Kohl di Jerman. Foto Resmi Habibie dan Ainun 1998. Pada era pemerintahannya yang singkat ia berhasil memberikan landasan kokoh bagi Indonesia, pada eranya dilahirkan UU Anti Monopoli atau UU Persaingan Sehat, perubahan UU Partai Politik dan yang paling penting adalah UU otonomi daerah. Melalui penerapan UU otonomi daerah inilah gejolak disintegrasi yang diwarisi sejak era Orde Baru berhasil diredam dan akhirnya dituntaskan di era presiden Susilo Bambang Yudhoyono, tanpa adanya UU otonomi daerah bisa dipastikan Indonesia akan mengalami nasib sama seperti Uni Soviet dan Yugoslavia. Pengangkatan B.J. Habibie sebagai Presiden menimbulkan berbagai macam kontroversi bagi masyarakat Indonesia. Pihak yang pro menganggap pengangkatan Habibie sudah konstitusional. Hal itu sesuai dengan ketentuan pasal 8 UUD 1945 yang menyebutkan bahwa “bila Presiden mangkat, berhenti, atau tidak dapat melakukan kewajibannya dalam masa jabatannya, ia diganti oleh Wakil Presiden sampai habis waktunya”. Sedangkan pihak yang kontra menganggap bahwa pengangkatan B.J. Habibie dianggap tidak konstitusional. Hal ini bertentangan dengan ketentuan pasal 9 UUD 1945 yang menyebutkan bahwa “sebelum presiden memangku jabatan maka presiden harus mengucapkan sumpah atau janji di depan MPR atau DPR”.